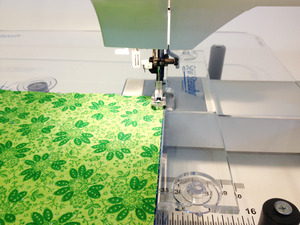 The NEW Universal Sew Straight Guide works on Sew Steady Tables and Dream World Inserts! Includes a Cling Centering Ruler for perfect seam allowance placement. Our NEW Universal Sew Straight Guide is designed to work on both our Sew Steady Portable Tables and our Sew Steady Cabinet Inserts! Made of 1/8"-thick acrylic, it comes with 2 suction cups to secure the guide to the sewing surface. Also comes with a cling-on Centering Ruler to help line up projects with the needle. Constructed of heavy ¼ “ Acrylic made in the USA. Place on either side of the needle. Ideal for left handed sewers. Includes Cling Ruler to set guide for desired seam allowance with 6" of allowance on each side. *Please note: The Sew Straight Guide may not accommodate for Sew Steady Tables that have an embroidery cut-out. What a wonderful product! How I wish I had discovered it earlier. I was thinking about making a sewing table (I am a woodworker), but then I found Sew Steady... much easier! I am now making a large bed skirt and there is lots of fabric. THe Sew Steady makes everything quite manageable. I had been a little confused about which of 2 products I should purchase. Your customer service person was excellent in answering my questions. Thank you and goodbye! This table is a God Send. I got it within 2 weeks and it fits my machine perfectly. It allows me to work on bigger projects without so much struggling. I have a Viking Topaz 30 and would recommend this to friends and family. I will always shop at Allbrands. I had a problem with my last purchase (ordered wrong size) and had to fly to CA; by the time I got back the order had been sitting at my house long past the thirty days. I called and explained the situation, and Allbrands got a return request for me. The customer service always outweighs the price with me!!!! I am very happy with my straight guide and all of the items that I have ordered from AllBrands have been exactly what I wanted and needed. The cost are very much to my budget limits as I live on a fixed income. Thanks for your speedy deliveries and services. I have ordered from Allbrands many times and have had the best service each time I ordered. Thank you for your service.